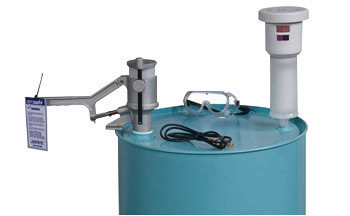 This foot operated, one-piece cover provides a safe disposal container for oily rags. Extra convenient when used with disposable collection bags. FM, UL approved. This item cannot be shipped to APO/FPO addresses. 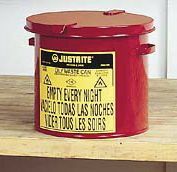 Rely on Justrite(�)Transfer Accessories to help keep your workers safe and work areas clean when dealing with flammable liquids. 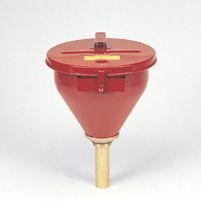 Drum Funnel/Steel Flammables Disposal Funnel has a 10-3/4" mouth, fusible link activated cover and 6" brass flame arrestor. This item cannot be shipped to APO/FPO addresses. 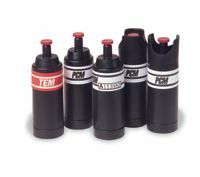 Self-closing cover isolates contents from fire sources. Rugged, lead-free galvanized steel body with durable powder coat paint finish. Raised flow-through base dissipates heat. Convenient carrying handle. Trilingual safety label. 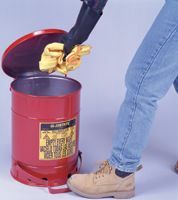 Waste Receptacle Type: Flammable Waste Bin; Material(s): 24-Gauge Steel; Application: Flammable Waste Disposal; Capacity (Volume): 14 gal.